For the month of April, H3S, AGU’s Hydrology Section Student Subcommittee, will be taking over CUAHSI’s Cyberseminar series. Each of the four seminars will showcase talks by four early career scientists studying some of the most pressing issues around hydrology and beyond, including 1) Coastal Dynamics in a Changing World, 2) Rivers and Lakes Under Changing Climates, 3) Water Resources and Management, and 4) Water Pollution and Quality. Scientists will give short presentations on the week’s theme followed by a brief Q&A. 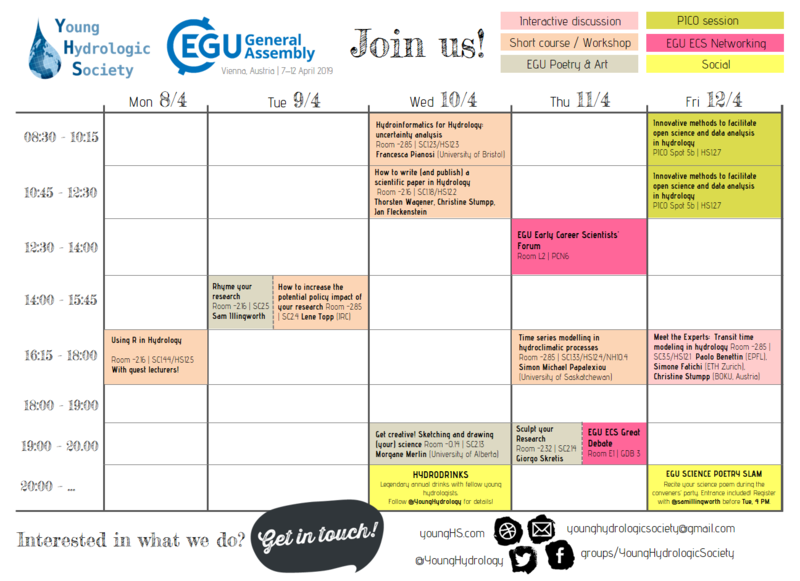 YHS at #EGU19 | Plan your week! You are kindly invited to joins us in these short courses, PICOs, etc. If you have any questions about specific sessions / events, don’t hesitate to contact YHS or the conveners. More information on Hydrodrinks will be available during the EGU week! Follow YHS on Twitter (@YoungHydrology) and Facebook! Please find details and how to apply here. Please see the EGU ECS page for eligibility. The tenth edition of the STAHY International Workshop, STAHY 2019, is organized by the International Commission on Statistical Hydrology (ICSH) of the International Association of Hydrological Sciences (IAHS), in cooperation with the Hohai University. It will be held in Nanjing, China betweeb 19-20 October 2019 at the College of Hydrology and Water Resources, Hohai University. The potential participants could submit 1-page abstract through the IAHS-Copernicus Abstract Management System (will open soon). STAHY 2019, similarly to previous editions (STAHY 2018 in Adelaide, South Australia & STAHY 2017 in Warsaw, Poland), will focus on statistical methods for hydrological applications. The topics range from big data to extremes and climate change but also prediction and uncertainty. This diversity makes this conference so interesting. I participated in this conference twice and I can highly recommend the participation. Due to the small community with about 100 people, the conference is very familiar and one gets in touch with the other researchers easily. It has been a great opportunity for me as an early career scientist to talk to experts about my research. On the day before this workshop (Oct 18, 2019), also an Early Career Course will be held as well as a short reception for the early career members. Further information can be found at: http://www.stahy2019.org. I hope to see many of you at the STAHY 2019! Svenja Fischer (Svenja.fischer@rub.de) is a Post-Doc at the Ruhr-University Bochum working on flood statistics and Early Career Committee Representative for the IAHS (@IAHS_AISH) International Commission on Statistical Hydrology. As we are getting closer to say goodbye to 2018, the next European Geosciences Union General Assembly is seen on the horizon. Since 2005, Vienna has been the most popular destination during lovely spring time for many hydrologists all over Europe (and all around the world, one can say looking at the statistics from EGU 2018). There is no doubt that the EGU GA 2019 (7–12 April 2019) will be no exception considering the highly rich programme of the Hydrological Sciences (HS) Division (>120 HS-led sessions) for EGU 2019! The sessions can be browsed by selecting “Hydrological Sciences” in the programme groups. You can submit abstracts until the deadline 10 January 2019, Monday (13:00 CET). The call for abstracts can be read here. A –Streams of Thought– contribution by John Van Stan & Jan Friesen. Understanding and learning from unexpected results is a fundamental element of science. Different names exist for these results, e.g., failures, obstacles, or unexpected results. Although all of these names sound unexpected, they are important for the understanding of processes, developing and testing of theories, and identifying pitfalls and possible dead-ends in science. By carefully designing and conducting experiments with some level of trial-and-error, researchers eventually find results that will be published in peer-reviewed scientific journals. Paradoxically, we typically only publish the successful tests and their results. What comes of the weeks to months of critical information that led to this successful experiment? It usually remains in the dark. However, not sharing unsuccessful iterations or unexpected results — defined here as experiments that do not adequately confirm an accepted hypothesis, despite sound and careful experimental design, planning, and execution — along the way prevents others to learn from these endeavors (Nature Editorial, 2017). In the past, many philosophers, including Popper (1963) and Chalmers (1973), have emphasized that science can only advance by learning from mistakes. Moreover, recent literature in various fields elaborate on the many benefits and values of publishing unexpected results and call upon the scientific community to nurture their dissemination (e.g., Andréassian, et al., 2010; Schooler, 2011; Matosin et al., 2014; Granqvist, 2015; Goodchild van Hinten, 2015; Boorman, et al., 2015; PLOS collections; 2015, 2017; Nature Editorial, 2017). Despite the various calls to report such results and the frequency they occur in the labspace, they are still underrepresented in most fields of our current publication system. The reasons can be manifold such as, a lack of incentive (no scientific reward) or the fear of a negative reputational impact. So, why should you report your failed approaches and unexpected findings? How and where can you share your unexpected findings? We aim to stimulate this discussion via the new Young Hydrologic Society collection “Unexpected Results in Hydrology”. We want to instill a positive perception to change the way in which the scientific hydrologic community value unexpected and negative results including individual researchers, scientific societies, funding agencies, and publishers. Therefore, we invite researchers to report their negative and unexpected results, such that we are able to holistically advance science – by sharing our failures, not only our successes. Reporting on such findings should include the following components in a maximum of 3,000 words: 1) an original research objective and expected results, 2) a brief summary of experimental design and methods, 3) discussion on the experimental results and challenges, including images and/or figures, and possibly 4) lessons learned and the path forward. After a peer-review done by the editors of this collection, the post will get a DOI and will be visible on the YHS website and on a dedicated ResearchGate project site. On ResearchGate we invite discussions on published submissions such that the authors can receive feedback to facilitate new insights from the scientific community. Upon enhancing their previous analysis or coming to new conclusions, we welcome resubmissions by the original authors. Andréassian, V., Perrin, C., Parent, E. and Bárdossy, A. (2010). Editorial – The Court of Miracles of Hydrology: can failure stories contribute to hydrological science? Hydrol. Sci. J. 55(6), 849–856. Chalmers, A.F. (1973). On Learning from Our Mistakes, The British Journal for the Philosophy of Science (Oxford University Press) 24(2), 164-173. Goodchild van Hilten, L. (2015).Why it’s time to publish research “failures”-Publishing bias favors positive results; now there’s a movement to change that. Elsevier Connect. Early Career scientists make up a significant amount of our community, creating an opportunity to include a new generation of hydrologists as active contributors to IAHS. Early Career scientist involvement in geoscientific organizations has rapidly increased over recent years. Organizations such as the American Geophysical Union (AGU) and the European Geosciences Union (EGU) have adopted Early Career representation in committees, board and executive committees. During its Bureau Meeting in July 2017 (held in Port Elizabeth, South Africa following the IAHS Scientific Assembly 2017), IAHS decided to strengthen its Early Career scientist representation to enable more active participation of those members within IAHS Commissions and Working Groups. 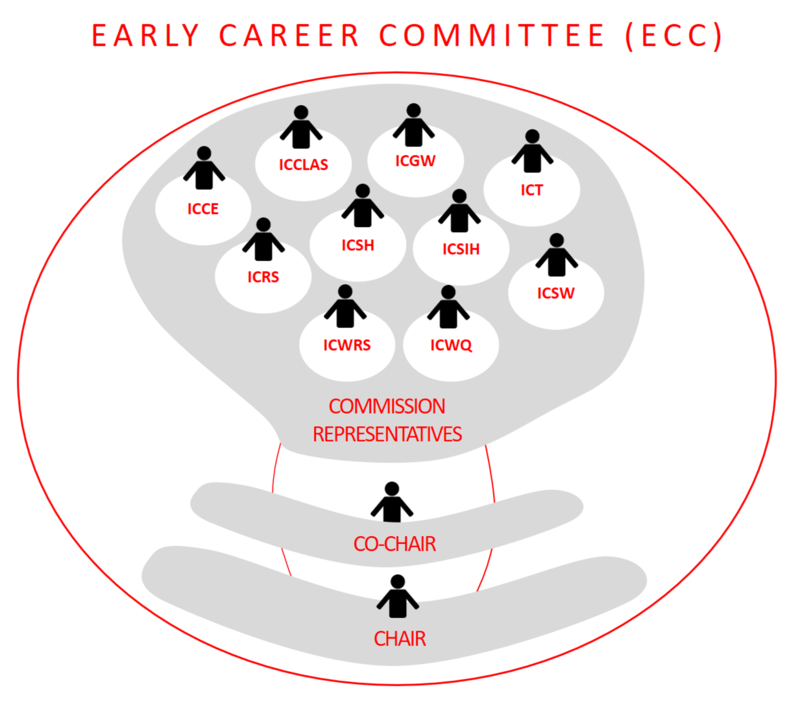 To achieve this goal, in line with the proposal submitted by Tim van Emmerik and Nilay Dogulu—and approved by the Bureau members—IAHS will establish an Early Career Committee (ECC) consisting of the Early Career Representative of each IAHS Commission plus a chair and co-chair. The IAHS definition of Early Career embraces scientists up to 5 years after completion of the PhD (allowing for an extra year per child for parents if they took parental leave). The ECC is aimed at representing the Early Career membership of the IAHS at the highest level, and within each Commission. ECC members are dedicated to fostering dialogue between Early Career members, and between current and future generations of hydrologists. The ECC chair will be appointed by the IAHS Bureau and will join the IAHS Bureau meetings as an observer. The chair will be encouraged to also be an active member of the Young Hydrologic Society to assure strong connections with other Early Career initiatives in the hydrological community. A –Streams of Thought– contribution by Caroline Aubry-Wake, Gaby Langendijk, Marisol Osman, Carla Gulizia. On May 3-5, 40 early careers researchers from 23 different countries grouped together for an in-depth interdisciplinary discussion on generating regional information to improve our understanding of weather, water and climate extreme events. This workshop, organized jointly by the Young Earth System Scientist (YESS) and the Young Hydrologic Society (YHS), took place prior to the 2018 GEWEX Open Science Conference (OSC). The goal of the workshop was to develop a shared ECR vision on challenges and ways forward to enhance the generation of usable regional information for water, weather and climate extremes, and the utility of that information for users, decision makers and other stakeholders. During the three days, the discussions centered on three topics: data sources (conventional and unconventional), scale-interactions and user needs. The following points summarize some tips that were provided during the short course ‘How to write (and publish) a scientific paper in Hydrology’ held at the 2018 EGU General Assembly in Vienna. The tips are based on the input from the expert panel consisting of Hannah Cloke (University of Reading), Giuliano Di Baldassarre (Uppsala University), Ciaran Harman (Johns Hopkins University) and Margaret Shanafield (Flinders University). In December 2017, Patricia Gonzalez and her colleagues published a paper on a novel water demand system dynamics model that integrates social and structural drivers of water conservation in WRR. We asked her a couple of questions. A –Streams of Thought– contribution by Nilay Dogulu. Dr. Johannes Cullmann is a hydrologist, currently acting as the Director of the Climate and Water Department (CLW) at the World Meteorological Organization (WMO). His scientific background is flood forecasting, and has vast working experience in hydrology practice in the international context. Johannes Cullmann is also the Head of the CLW’s Hydrology and Water Resources (HWR) Branch where I worked as a consultant last summer. I had the pleasure to interview him briefly in his office at the WMO Secretariat (Geneva, Switzerland) despite his tight schedule and being often on missions. Join us and @YESSCommunity in Canada May 2018 for the ECR workshop: ‘Towards Regional Information to Improve Our Understanding on Weather, Water and Climate Extreme Events’ prior to @GEWEX_WCRP Conference: EXTREMES AND WATER ON THE EDGE! See website for more details on how to apply and for availability of (limited) travel funding etc. here. A “Streams of Thought” contribution by Andrea Popp. A scientific poster is a communication tool explaining your work and encouraging conversation with colleagues. However, making a good poster is not easy. The following list provides ten guidelines for an awesome poster to help you to communicate your work more efficiently. You also find insider tips from recent EGU and AGU Outstanding Student Poster Award winners (Skuyler Herzog, Ingo Heidbüchel, and Michael Stölzle) and some great advice from the EGU Hydrology OSPP coordinators Luisa Hopp and Julian Klaus. 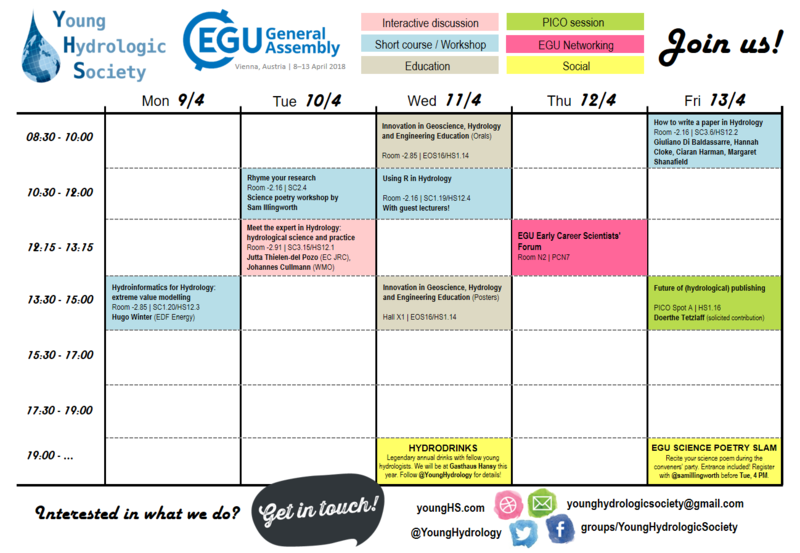 This month is all about the EGU elections. Until November 30, you as EGU member can vote for important functions, such as the EGU President and EGU Division Presidents. During these elections we can also vote for our new EGU Hydrology Division President. We decided to conduct a short interview with the two candidates: Thom Bogaard and Maria-Helena Ramos. Our voting advise: Go Vote! Check our email for your voting ballot. The next European Geosciences Union General Assembly will take place between 8–13 April 2018 in Vienna, Austria. Don’t forget to submit your abstract to the conference by 10 January 2018. 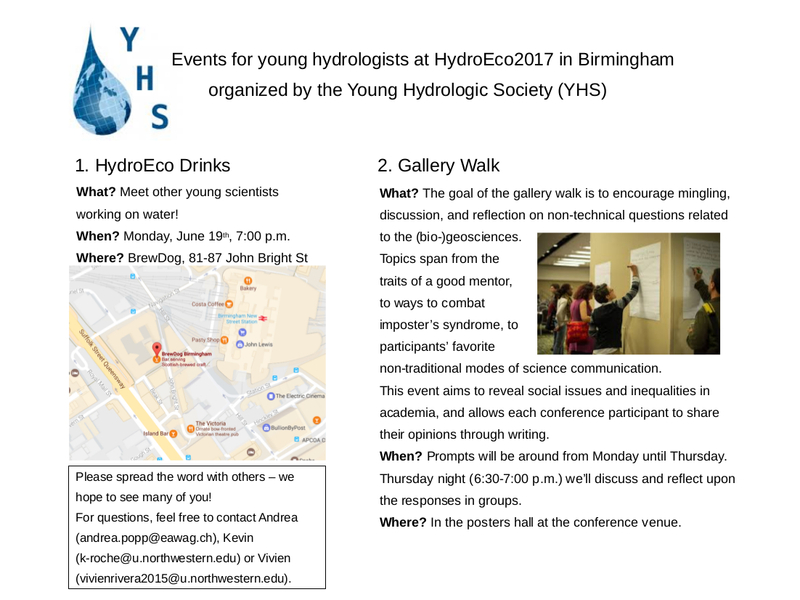 A core mission of the Young Hydrologic Society (YHS) is to better connect early-career hydrologists right from the beginning of their careers. To date this has been done by creating an online platform and organising events at major international conferences, such as the European Geosciences Union (EGU), American Geophysical Union (AGU), and International Association of Hydrological Sciences (IAHS) events. The society was started and is maintained by a small core group of people. Mapping spatial coverage of current YHS National Reps – let’s turn the whole map blue! On October 18th, 2012 YHS launched this website. The first post announcing the existence of YHS only reached 38 people. Luckily, over time the visits to the website increased. By now, the website has over 50.000 page views by visitors from 162 countries. In the remainder of this post, we will highlight some of the most popular sections of the website. Q1. What book or paper has been most influential to your career and why? Q3. What is your golden tip for current early career scientists? Q4. What (avoidable) mistakes did you make early in your career? Q5. How can young scientists improve their writing or presentations? We thank all hydrologists that have been so generous to share their knowledge and took the effort to respond. The advice here reflects a diversity of philosophies that have led to a wide variety of careers. All responses are listed below (in alphabetical order). Enjoy reading! This week marks the fifth anniversary of the Young Hydrologic Society. To celebrate this occasion, we will have daily posts covering highlights of the past years, an outlook to the future, and several other surprises. In our first post of the week, we keep it short and focus on the most important part: YOU! We thank everyone that has actively contributed and/or participated to YHS activities over the past years. Without your generous help and your enthusiasm, none of this would have been possible. We had a lot of fun! We hope you did so too! On to the next five years! Wouter Berghuijs, Nilay Dogulu, Harsh Beria, Andrea Popp, Shaun Harrigan, Hannes Müller, Marius Floriancic, Tim van Emmerik. Here’s a link to a paper that describes a bit of the history of YHS. Dr. Harry Lins is a hydrologist specialized in stochastic hydrology and hydroclimatology, and the current President of the World Meteorological Organization (WMO) Commission for Hydrology (CHy). 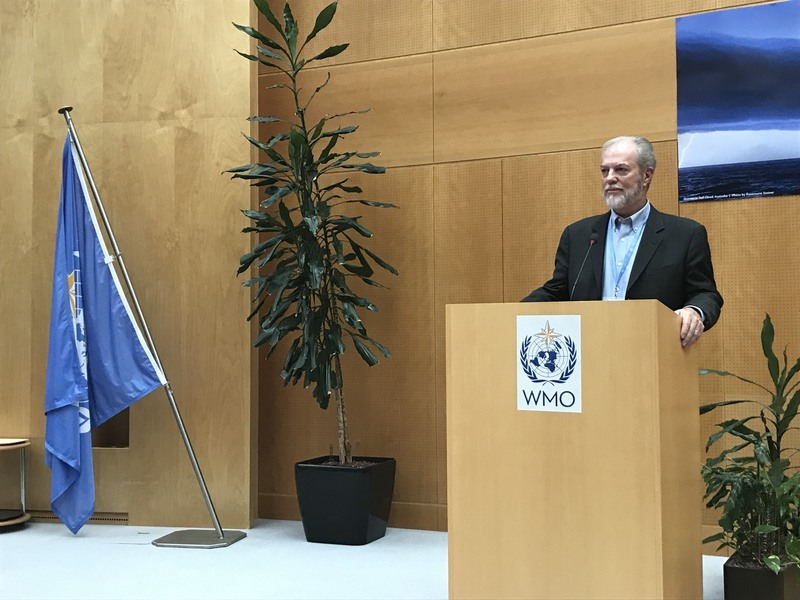 He chaired the annual meeting of the Advisory and Management Committees for the Associated Programme on Flood Management (APFM) (held from 4-5 September 2017 at WMO Secretariat in Geneva, Switzerland). Attending the same meeting as part of my (external) consultancy for the APFM Technical Support Unit, I took the opportunity to interview him. Harry Lins kindly accepted answering our questions during one of the lunch breaks in between his busy schedule full of meetings. Claudio Caponi is the Chief of the Division of Capacity Building in Hydrology and Water Resources – one of the three divisions under the WMO’s Climate and Water (CLW) Department, Hydrology and Water Resources (HWR) Branch. 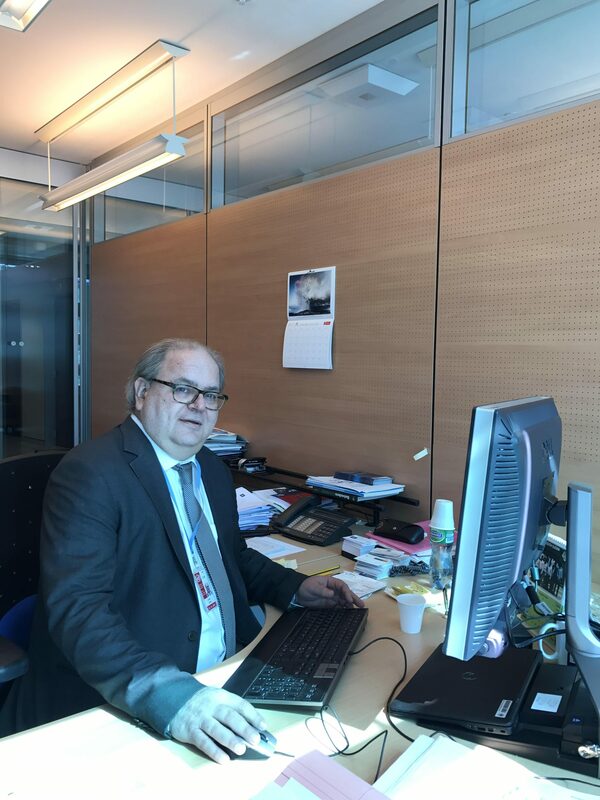 He has been working at WMO Secretariat in Geneva since January 1999. He has substantial experience in capacity building for hydrological services particularly in developing countries. I met Claudio Caponi for the first time during the Expert Forum on Disaster Risk Reduction (DRR) in a changing climate: Lessons learned on lessons learned back in early 2015. Furthermore, I had the pleasure to work with him this summer during my time at WMO as a consultant for the HWR Branch. I took this opportunity and interviewed him to understand about the hydrological practice in the world. He kindly answered our questions at the WMO Secretariat attic floor with the amazing view of the Lake of Geneva. A –Streams of Thought– contribution by Andrea Popp. Stefan Uhlenbrook at EGU 2017. 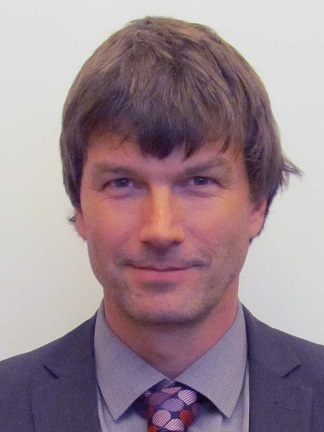 Stefan Uhlenbrook is working for the United Nations (UN) as the Coordinator of the World Water Assessment Programme (WWAP) and is the Director of the Programme Office on Global Water Assessment in Perugia, Italy. Additionally, he holds a professorship for experimental hydrology at Delft University of Technology, The Netherlands. Previously, he worked at UNESCO-IHE (Delft) as Professor of Hydrology as well as Vice-Rector and Director a.i. for Academic and Student Affairs. Stefan Uhlenbrook did his PhD and habilitation on investigating runoff generation processes at the University of Freiburg in Germany. I had the pleasure of meeting Dr. Uhlenbrook at this year’s EGU General Assembly in Vienna where I interviewed him about his work and also asked for some advice for young hydrologists. Research “Hylight”: Hydrological response characteristics of Mediterranean catchments at different time scales: a meta-analysis by Merheb et al. In January 2016, Mohammad Merheb and colleagues published a paper on comparative Mediterranean hydrology in Hydrological Sciences Journal. At the 2017 IAHS General Assembly, Mohammad was awarded the Tison award for this paper, and we decided to ask him a couple of questions. Q: Let’s start with the basics. Where are you from, where are you based, and what are you working on now? A: I am from a small village called El-Bireh located in Akkar district in the northern part of Lebanon. Now, I live and work in Tripoli, a port city in northern Lebanon where I am based at the Lebanese University. However, I must say that the article that won the Tison award was written when I was doing my PhD. I was based in Irstea, Montpellier, France and the L-CNRS, Beirut, Lebanon. Nowadays, my main work is teaching. Nevertheless, I am still working on some research projects that I have started during my PhD. These are mostly related to catchment classification and regionalization studies. Research “Hylight”: Complex Picture for Likelihood of ENSO-Driven Flood Hazard by Emerton et al. In March, Rebecca Emerton and colleagues published a paper on ENSO-Driven Flood Hazard in Nature Communications. The paper found a more complex picture than is often assumed. We decided to ask Rebecca a few questions about the paper. A –Streams of Thought– contribution by Tim van Emmerik & Nilay Dogulu. From 10 to 14 July, 2017, the Scientific Assembly of the International Association of Hydrological Sciences (IAHS) took place in Port Elizabeth, South Africa. For the first time, YHS organized a series of events for Early Career Scientists (ECSs) on the African continent. By combining social and scientific elements, the program was aimed at connecting ECSs from all around the world to each other, and to more established scientists. Three main events were organized: (1) Meet the Expert: “Predictions in ungauged basins under change”, (2) How to write a paper session, and (3) Early Career Community Building Discussion Session. Below we provide a short summary of all events. Risk-based decision making game for operational water management – it was fun! Enthusiastic hydrological forecasters at the EGU 2017 short course! This year’s HydroEco conference in Birmingham focussed on the growing importance of ecosystem services to hydrologic research. The conference successfully highlighted the diversity of this interdisciplinary field, with topics addressing relationships between hydrology, ecosystems and human interactions at different scales. For those interested in the diverse presentations held at HydroEco2017: check #Hydroeco17 on Twitter. YHS organized a “Gallery walk” which aimed to discuss social issues and inequalities in academia. Poster prompts were hanging in the posters hall allowing each conference participant to share their opinions through writing. Here, we selected some interesting comments on the prompts. Thanks to everyone who participated with their inspiring contributions! Geostatistics in R (by Emmanouil Varouchakis) – will be available here soon, check this post later this month! Science and forecasting practice are the foundations of the HEPEX community. These are certainly the routine of many of us during our office hours and while spending time in front of your computers. But this community is also based on individuals, and this is often what really makes it fun to go to meetings, workshops and conferences. Face-to-face interactions often bring new ideas into form (see also this previous post from CSIRO team), while also helping us to further develop interpersonal skills. For more information please feel free to contact Andrea Popp (andrea.popp@eawag.ch) or Kevin Roche (k-roche@u.northwestern.edu). Looking forward to meeting you at HydroEco2017! Program with informal and scientific parts. Highlight is the Meet the Expert session, during which three experts will share their visions on “Predictions under change in ungauged basins”. After 10-15 min presentations, the floor will be opened for an interactive discussion. This short course will shortly recall some basic aspects of paper writing (in terms e.g. of content, form and readership) and give practical tips of how to get started, how to respond to reviewers’ comments, how to “negotiate” the author list, and how to select a journal. After the Short Course, Early Career scientists can join for (non-sponsored) drinks and dinner at Blue Waters Cafe. This meeting will be open to representatives of early career networks, early career leaders, and anyone who is interested in contributing or participating in creating a community for young scientists. Participants will share examples of existing early career networks and leadership activities, and brainstorm about potential improvements for the (near) future. All sessions are free of charge. Registration is appreciated (can be for each session separately, or all at once), to make sure all practical arrangements are made. To register, please send an email to t.h.m.vanemmerik@tudelft.nl. We look forward meeting you in Port Elizabeth! This year, Elham Rouholahnejad Freund published a paper on how spatial heterogeneity and lateral moisture redistribution affect average evapotranspiration rates. We decided to ask her a couple of questions. Q: Where are you from, where are you based, and what are your research interests? I grew up in Iran, Isfahan and moved to Switzerland in 2009 to do a PhD at ETH Zurich. I am a Civil Engineer by background and studied Environmental Engineering and Environmental Science in my Master and PhD program. I finished my PhD at ETH Zurich in 2014 and did a postdoc at the department of Environmental Systems Science at ETH. I had been awarded a 2-year mobility grant by Swiss National Science Foundation (SNSF) to pursue my research in groundwater- soil moisture- atmosphere interactions. I am currently in Gent University and will move to Princeton for the second half of my scholarship. Meet the Expert in Hydrology: Is research at different spatial scales connected? Young (and mature) scientist visiting the EGU 2017 conference had a chance to participate on a short course titled “Opinion papers in hydrology: Why and how”. Bettina Schaefli, Vazken Andréassian, and Hubert Savenije shared their experience and opinions on this topic. Participants of this course could enjoy insights into pros and cons of opinion papers, as well as personal advice of the speakers. Bettina suggested to base an opinion on a quantifiable message, while Huub believes that opinion paper should be personal and controversial. Vazken discussed the use of humour in opinion papers and emphasised the readability. Two things all speakers agreed on was that one should write only few opinion papers, and that good opinion needs “time to settle in” (just like pancake batter). Ross Woods (University of Bristol) taught this year’s How to write a paper short course, focussing on “How to get your hydrology paper published – dealing with editors, reviews, and revisions”. The slides of the short course are available online. On our website, you can also find the slides of previous versions of How to write a paper. Research “Hylight”: CO2‐vegetation feedbacks and other climate changes implicated in reducing base flow by Ralph Trancoso et al. Recently, Ralph Trancoso and colleagues published a paper on CO2‐vegetation feedbacks and river flow. We decided to ask him a couple of questions. Q: Where are you from, where are you based, and what are your current research interests? Research “Hylight”: The global distribution and dynamics of surface soil moisture by Kaighin McColl et al. This year, Kaighin McColl published a paper on global distribution and dynamics of surface soil moisture, based on NASA’s SMAP satellite. We decided to ask him a couple of questions about him and his research. A scientific poster is a visual communication tool summarizing your work and encouraging conversation with colleagues. However, posters are often poorly designed, e.g., they are densely packed and overloaded with text. This makes it difficult and tiring for the audience to understand the content. The following list provides 10 guidelines for an awesome poster to help you to communicate your work efficiently. We spiced this blog with insider tips from recent EGU and AGU Outstanding Student Poster Award winners (Skuyler Herzog, Ingo Heidbüchel, and Michael Stölzle). Registration is now open for the 2017 Gordon Research Conference (GRC) and the 2017 Gordon Research Seminar (GRS) on Catchment Science: Interactions of Hydrology, Biology & Geochemistry. The theme of this GRC is “Crossing Boundaries and Seeking Synthesis in the Catchment Sciences.” The GRS will take place from June 25-30, 2017 at Bates College, Lewiston, ME and will be chaired by Jakob Schelker and Kevin McGuire. For more up-to-date information on times and places for these events, please visit https://www.grc.org/programs.aspx?id=12331 or contact Inge Wiekenkamp (i.wiekenkamp@fz-juelich.de) or Robert Sabo (Sabo.Robert@epa.gov ). 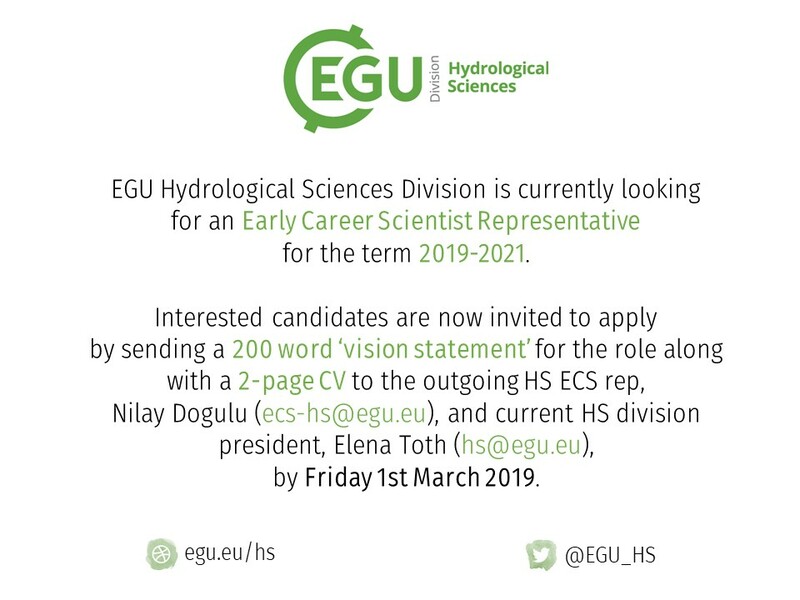 The position of European Geosciences Union (EGU) Early Career Scientist (ECS) representative for the Hydrological Sciences (HS) division is now open and seeking applications for the next 2 year term (April 2017-April 2019). Please find details and how to apply here. Please see the the EGU ECS page for eligibility. A –Streams of Thought– contribution by Yvonne Smit. A –Streams of Thought– contribution by Matthew Morison. A little background: recently, the Canadian branch of the Young Hydrologic Society was formally recognized as a committee of the Canadian Geophysical Union Hydrology Section. As an international member of the diverse global YHS community, we are so excited to be apart the next generation of hydrological research and to have new links to so many different regions and countries! In this spirit, this article strives to shed some light on some research which is not uniquely Canadian (in fact, far from it), but remains a large research focus in Canada – permafrost hydrology.